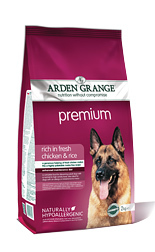 Arden Grange PREMIUM dog food rich in fresh chicken diet has been specially formulated to provide all the daily nutritional requirements for an adult dog with a normal lifestyle. Recommended for: Fussy eaters, dogs that need to gain weight, owners who are looking for a very high meat inclsuion (38% chicken plus additional quality proteins from egg and fish to provide an excellent amino acid profile), working dogs with a moderate to high activity level, and show dogs. All Arden Grange dog food products are hypoallergenic and free from wheat gluten, dairy products, beef and soya. They contain no artificial colourings flavourings or preservatives. Feeding Arden Grange can reduce the risk of dietary intolerances and allergies that can cause digestive disorders and skin complaints. Chicken; (fresh chicken 20%; chicken meat meal 20%); rice; potato; refined chicken oil; beet pulp; whole dried egg; chicken digest; fish meal; yeast; krill; whole linseed; minerals; prebiotic FOS; prebiotic MOS; yucca extract; glucosamine; MSM ; chondroitin; cranberries; nucleotides.